Freeman’s world-traveled twang and stage presence is the mark of someone who can sing a Johnny Cash song like “I Been Everywhere” and actually mean it. Sure, places like San Clemente and Dana Point aren’t exactly the Nashville of the West Coast. But sit in on one of Tricia Freeman’s gigs at The Sun Dried Tomato Cafe or the Sawdust Art Festival, and those cowboy boots you wore to the show will feel more than comfortable. 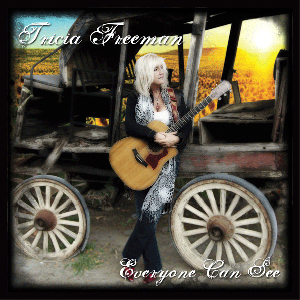 Whether it’s strumming country ballads, gritty delta blues or a track from her recently-released album Everyone Can See, Freeman’s world-traveled twang and stage presence is the mark of someone who can sing a Johnny Cash song like “I Been Everywhere” and actually mean it. This weekend, she and her band are taking on one of the anticipated down-home festivals of the summer, the third installment of The Real Blues Festival at Malone’s in Santa Ana. We caught up with Freeman on the phone to discuss new songs inspired by old memories and her upbringing, carving a niche in South County and falling back on her experience as a pig farmer’s daughter. OC Weekly (Nate Jackson): What tends to inform your style as a blues artist? Tricia Freeman: When it comes to my style, it’s all about what the lyrics are. There’s so many different styles of blues–I have a lot of country in me, kind of Patsy Cline, Bonnie Raitt and older stuff from the ’40s. I just write whatever comes into my head and the songs really write themselves. The title track of your latest album “Everyone Can See” has an older, roots music vibe to it. What do you think brought that sound out of you in that particular instance? You’ve lived in SoCal for a while now, but how much Kansas culture still creeps into your songwriting? Tricia Freeman: I was brought up in Kansas and Texas and I went from a doctors daughter in Kansas to a pig farmer’s daughter down in Texas when I was younger. My dad was a doctor in Kansas and my my parents had four kids, got married and divorced twice and we all ended up moving down to Texas to live with my moms parents and she ended up marrying her high school sweetheart who was a pig farmer. I raised hogs I’ve kind of grown up with all aspects of life from total country to blues and hillbilly. When I came to California, I hadn’t been doing any music of my own at first so all the stuff I wrote was inspired from that early point in my life.